Hurricanes and blizzards are petty trifles compared with the weather phenomenon that troubles apocalypse preppers: They’re worried about a giant electromagnetic storm wiping out all technology. It’s an unlikely scenario — a massive solar storm strikes only about once every 500 years — but if the Earth was hit by one, power grids across the world could be permanently fried. “Frankly, this could be one of the most severe natural disasters that the country, and major portions of the world, could face,” renowned space weather consultant John Kappenman told Gizmodo. How would we survive the space storm? To find out, I spoke with individuals already prepping for the technopocalypse, and engineers hoping to fortify our infrastructure against it. To prepare for power outages following a massive solar storm, the National Oceanic and Atmospheric Administration (NOAA) advises building a disaster supply kit with enough food, water and medication to last at least 72 hours. NOAA further recommends keeping your car’s tanks at least half full (gas stations rely on electricity to power their pumps), and stocking your freezer with ice to keep essential perishables cold. These preparations will buy first responders a little time to focus on restoring functionality to the grid. But they might not be enough. Preppers also say that you’ll need to have lots of cold, hard cash on hand. “But,” you protest, “there are digital copies of my money backed up in databases all over the world!” Guess what? If all those digital backups go down, so does your net worth. Stuff a bunch of cash under your mattress or bury it in your backyard. Or, as some inflation-wary individuals are doing, you can invest in physical gold and silver. Hoard that gold like a dragon. Space weather experts say that the induced ground currents from a large geomagnetic storm are mainly a concern for big infrastructure. But if you want to be absolutely sure your data and electronics remain safe, you can build a Faraday cage. As for what to store in your Faraday cage? That’s open to debate. Some preppers are putting solar batteries inside, others, Ham radio equipment. A retired forensic analyst and amateur photographer — whose Faraday cage consists of a nested set of galvanized trash cans — told Gizmodo he’s planning to store external hard drives, thumb drives, and exposure-metering devices. He’s currently building a long-term inventory list of other critical items. The answer, it would seem, depends on what you think the world will look like after the dust settles. When the 1859 Carrington Event — the largest geomagnetic storm on record — struck the planet, the global telegraph system acted as an antenna. Telegraph stations across the world caught fire, technicians were electrocuted, and widespread communications outages ensued. (A fascinating new research paper, available in pre-print on arXiv, describes what this event was like). Of course, having a designated rendezvous location in the event that the phones fail is also critically important. Prepper advice? Make sure it’s well outside the city. While most preppers are (understandably!) concerned with their own survival in the event of an apocalypse, some are focused on how humanity could rebuild in the aftermath. Rocky Rawlins, better known as “The Librarian,” has spent the last several years amassing a repository of forgotten knowledge that men and women can use to rebuild society in the event of a tech-obliterating EMP. Even if you don’t think the end is nigh, it’s worth taking a few moments to peruse Rawlins’ Survivor Library. It certainly helped me appreciate how much knowledge has slipped away over the years. And hey, if you’ve always wanted to build your own mechanical watch or learn how to make ice without modern refrigeration, now’s your opportunity. Preppers are concerned with making it after civilization collapses. Meanwhile, space weather scientists and engineers are wondering how we can avoid getting to that point. As Kappenman puts it, the real business of “prepping” for a massive geomagnetic storm needs to happen at the infrastructure level. 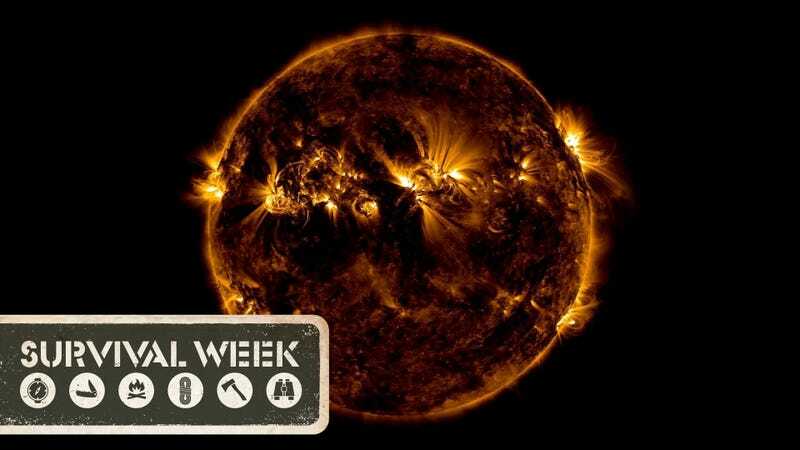 But as our arsenal of space weather-observing tech grows, so has our appreciation of just how large solar storms can get. “Just in the last year or so, from observations of other sun-like stars, we’re seeing there can be a potential for storms a factor of 10 to 100 times larger than the Carrington event,” Kappenman said. (I’d like to point out how incredible it is that we’re able to observe solar flares and coronal mass ejections on distant, sun-like stars at all, but that’s another post entirely). Those monster storms worry space weather scientists a lot; so much so that our government is finally beginning to listen. As Thomas Berger, director of NOAA’s space weather prediction center told me last month, the White House Office of Science and Technology Policy recently convened a task force to explore how we can fortify infrastructure against extreme solar events. The group’s recommendations are due out next month.